Well, maybe a lot of bad days. In February (2016) a new description of the holotype of Dilophosaurus wetherilli was published. A holotype is the specimen that is used to name the species. It can be the best example of the species and is usually the first one found. 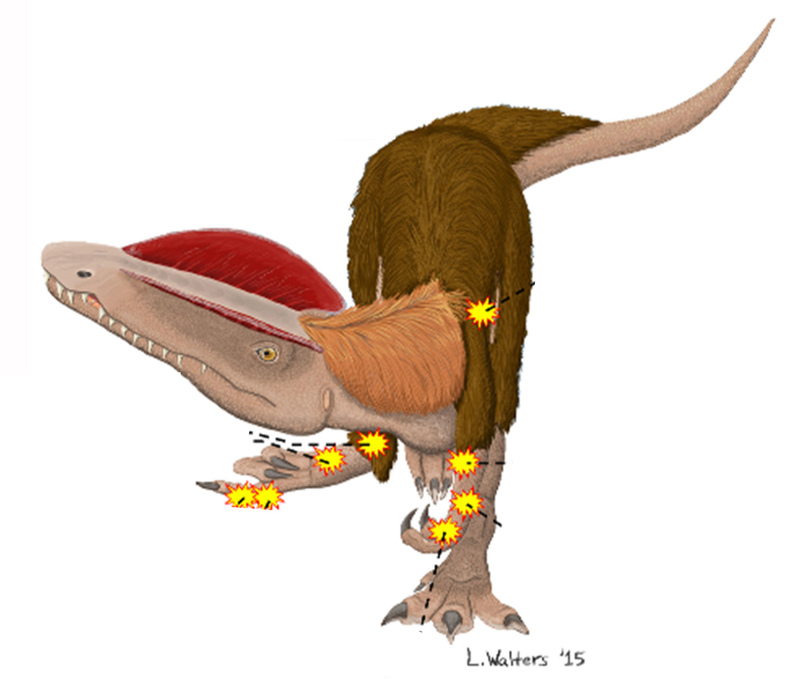 The authors pointed out not one, not two, not four, but EIGHT different injuries in this single Dilophosaurus. This is the most ever found for a single dinosaur. The previous record was four. 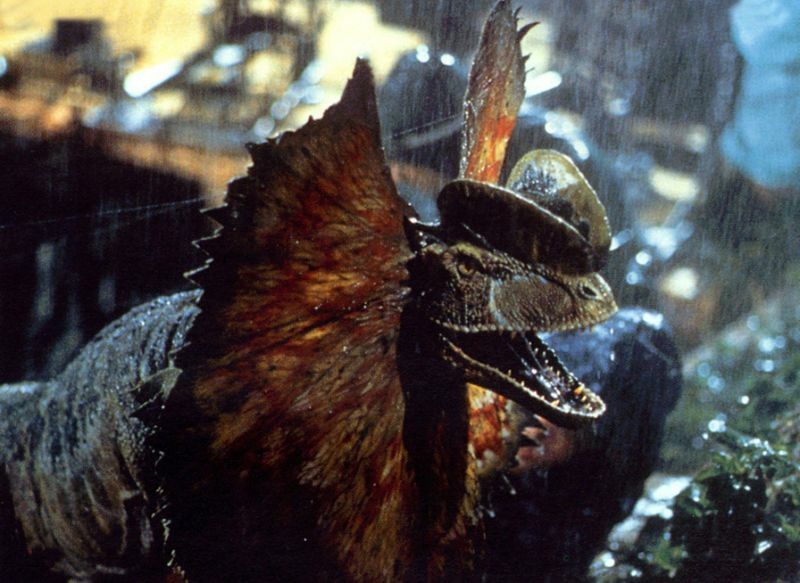 First, what is Dilophosaurus (Di-lo-fo-saur-us)? It is an early theropod (carnivorous) dinosaur that lived in the Early Jurassic Period. Its name means two-crested lizard, named for the two crests on its head. It is well-known for its supporting role in Jurassic Park, where it showed a large foldable frill and spit venom. There is no evidence for the frill or the venom, so those two features were made up for the movie. Dilophosaurus, like many other theropod dinosaurus, was probably entirely covered in feathers. Ok, back to the injuries! 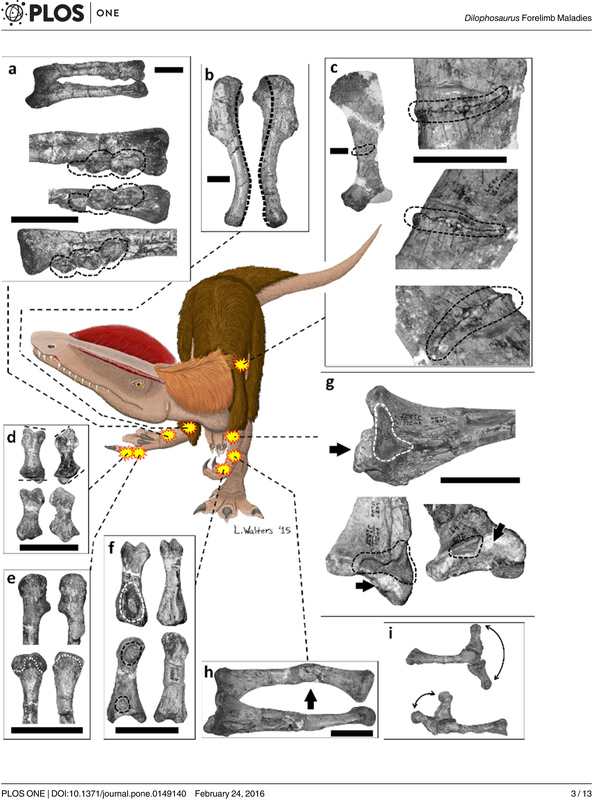 In this article published in PLoS ONE, they described 8 injuries in 1 dinosaur. Here’s the interesting part – they were all healed! That means that the dinosaur survived each injury for long enough for the bones to heal. All of the injuries were in its arms, so it had to either go without eating while they healed, or find smaller food that it could hunt with its mouth or feet. That’s a long series of terrible, horrible, no good, very bad days.